"Either write something worth reading or do something worth writing." This is what I concluded from this book. I spotted this book as a recommendation on Amazon. The title of the book was powerful enough to make me read the description. And I pre-ordered a copy, subsequently. 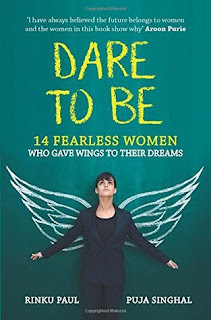 This is a book on success stories of 14 women who decided to embark on the journey of living their passion by calling it quits to their stable corporate career. All this was to live their dreams, irrespective of hurdles and naysayers in their way. The debut authors Puja Singhal and Rinki Paul have compiled the interviews they conducted of 14 women who quit their high paying corporate jobs to pursue the road seldom taken- standup comedian, authors, models, singers, dancers etc. Undoubtedly, this book is a great source of inspiration for those who want to transform their passion into profession, but are held back by naysayers and by the fear of taking a chance against their stable corporate careers. Each chapter is an account on the success journey of one of these 14 woman. Diligently penned, women-only stories, this book gives a sense of confidence to aspiring women entrepreneurs. However, it does not focus on empowering womanhood, but on tapping the power of actuating one's dreams, which is applicable to both the genders. This is a plus of the book. With good vocabulary, brevity of the content and ability to cover the whole in a concise manner, the authors have delivered a book which is one of its kind! While reading you may find yourself encounter multiple emotions every now and then- smiling, eager, angry, sad, relieved, stunned and lot more! My rating for this book is 4 on 5. Awaiting the next one by the authors, hopefully on a similar theme.